QUIZ is the story of a major TV scandal happened in 2001, when one of the participants of Who wants to be a millionaire, Charles Ingram (Gavin Spokes), a major in the British Army, was accused of cheating and was put on trial with his wife Diana (Stephanie Street) and another contestant, Tecwen Whittock (Mark Meadows), all charged with 'procuring the execution of a valuable security by deception'. The play dramatizes the trial and shows both prosecution and defence versions of the events. At the conclusion of Act I - the prosecution presentation - the audience voted overwhelmingly that the defendants are guilty (the audience is given an electronic keypad to vote). At the end of Act 2 – the defence presentation - the vote was not guilty. 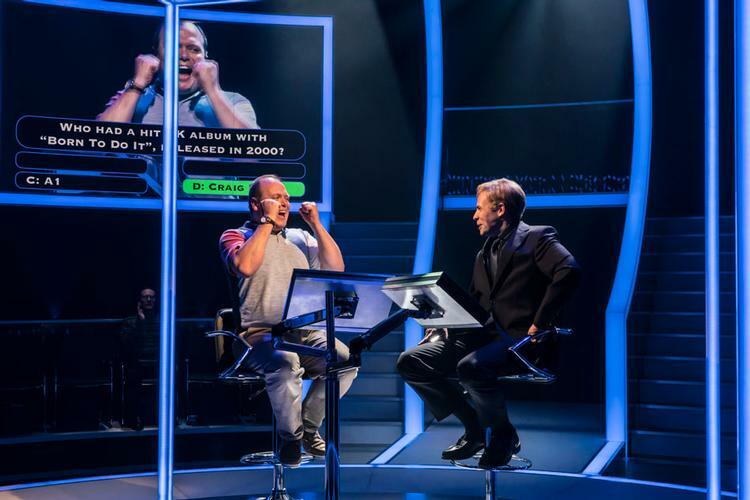 The show combines – very cleverly – trial and game show with audience participation. The stage and the production are really great and overall it is an informative and funny play. The courtroom trial is interrupted by flashbacks about the life of the major and his wife, by the history of entertainment in Great Britain, and some of these references might be hard to catch if you are not British. Even if for me Quiz lacked of any emotions, with a rather too long second act, it is an enjoyable play, with some interesting views about how information can be manipulated and politics. I am sure this play will be a hit because, even if it is a criticism of the obsession of Britain for quizzes, the audience will be amused by feeling like inside an ITV studio. For real.